Ken Shamrock tried to return after his loss to Tito Ortiz, but Shamrock suffered a torn ACL. He would have to wait another year to face Kimo at UFC 48. Speaking of Kimo, he returned after five years away from the Octagon. He beat Tank Abbott with an arm-triangle choke in just under two minutes. Vitor Belfort landed a barrage of knees and punches to score a TKO over Marvin Eastman at the 1:07 mark. “That was the old Vitor!” commentator Joe Rogan enthused. Wes Sims was disqualified in his heavyweight bout with Frank Mir for kicking a downed opponent. Vernon White replaced Shamrock and fought Ian “The Machine” Freeman to a draw. 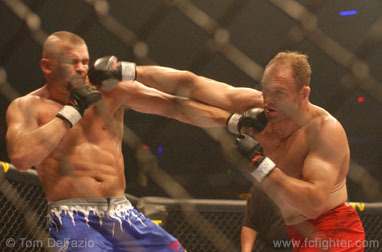 Matt Lindland knocked himself out while throwing Falaniko Vitale to the mat in a preliminary fight, making Vitale the winner in less than two minutes. In the other prelim bouts, Pedro Rizzo beat Tra Telligman in a bloody slugfest when the doctor stopped the fight in Round 2; and Yves Edwards beat Eddie Ruiz by unanimous decision.